Northamptonshire, about an hour and a half straight up the M1 from Central London, has got to be one of the UK's most unfairly overlooked and underrated regions for visitors. And yet it has all the attractions that vacationers and holiday-makers arrive in Britain to visit. The county is host to numerous historic homes, notable hotels, charming market towns and gardens, the epicenter of British motorsport, and even the childhood home and final resting place of Princess Diana. So why don't more people know about and visit Northamptonshire? Recently, a group representing local attractions, businesses and boosters asked the same question and decided to change all that with a colorful and stylish campaign — Northamptonshire: Britain's Best Surprise. The campaign shows the region off as a great destination target, whether for UK touring or weekend breaks from London or the cities of the Midlands and the North of England. If you are racing up the motorway to visit Diana's grave, then battling rush hour traffic back on the M1, you are missing the opportunity for a great short break. Here's why. At under 100 miles from London, Northamptonshire was just far enough away for politically ambitious aristocrats of the Tudor and Elizabethan times to stay out of sight and out of mind, yet close enough to reach the court in a few days of hard riding if summoned. Holdenby House: Pictured above, this lovely country house, surrounded by wonderful gardens, is just a shadow of its former self (or about one quarter actually). Built as a grand country estate by an Elizabethan courtier, it was turned over to the crown as a palace for King James and the ill-fated Charles I. Charles was imprisoned there during the Civil War and then arrested by Parliamentary forces. The archways he walked through heading for his final, bloody fate, are still standing. Check out the music room, where rare and unusual instruments have been collected from all over the world by the current occupants of the house. And make time to stay for a falconry demonstration. If you can imagine Holdenby draped in rotting vegetation, you might just remember it from the 2011 BBC production of Great Expectations with Gillian Anderson as Miss Haversham. It was the stand-in for her house. Althorp: Keen Royal watchers already know that this was the late Princess Diana's childhood home. But maybe you never knew that it has been in the same family for more than 500 years, has a spectacular collection of paintings (including a whole room of Joshua Reynolds portraits, another of Lely paintings of court mistresses and the only known life portrait of the tragic Lady Jane Grey) or that you can hire it for weddings and posh events. Deene Park: This once grand, originally Medieval, house was having a facelift under scaffolding in April 2017 - so a bit hard to judge. But a highlight is the room devoted to the notorious 7th Earl of Cardigan who led the infamous charge of the light brigade during the Battle of Balaclava (described in one account as "the greatest old woman in the army"). The room includes a portrait of his ravishingly beautiful (and scandalous) second wife and a glass case holding half of Ronald, the horse Cardigan rode into battle. Some years ago it was discovered that the taxidermed Ronald was becoming a bit moth eaten so now only half of him remains. Burghley House: A house full of many of its original treasures and works of art, built by William Cecil, Lord High Treasurer to Queen Elizabeth I and still considered one of the greatest Elizabethan houses in Britain. Boughton House: Begun in 1528 by the ancestors of the current owners, the Buccleuch family, the house morphed from a modest Tudor manor to a French style palace, sometimes called "The English Versailles". Among its treasures are paintings by El Greco, Van Dyke and Gainsborough as well as 150 acres of gardens and landscapes..
Apethorp Palace: A palace that once belonged to Queen Elizabeth I, and was a favorite of Jacobean and Stuart kings, was at risk of total collapse when purchased for the nation by English Heritage. Now, through a remarkable 80-year arrangement between English Heritage and the current owners, the house is being completely restored. It's open to the public by guided tours only, 50 days a year. Do keep in mind that most of the stately homes in Northamptonshire are still private family homes, with limited public openings. Check their websites to find out the dates of opening and the conditions of entry. Most of the stately homes mentioned above have gardens that can usually be visited even when the houses are not open to the public. And there are some great ones — from a restored Elizabethan kitchen garden at Holdenby House to a landscape by the legendary Lancelot Capability Brown at Burghley. There are 35 acres of gardens, open every day, year-round, set in the 10,000 acre Castle Ashby estate. And the county is laced with country parks, woodlands, arboretums and wetland reserves. But by far the most impressive garden is also one of the smallest. 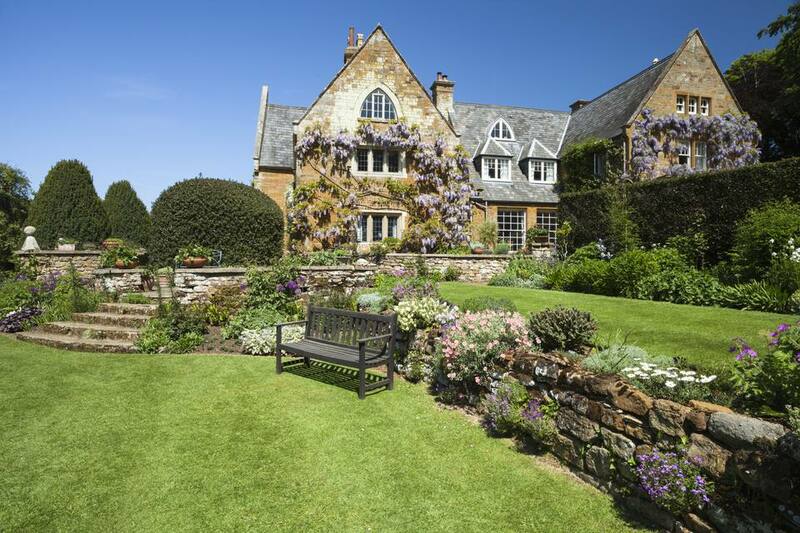 At ten acres, plus another 5-acre bluebell wood and a wildflower meadow, Coton Manor Garden is an attraction that punches well above its weight. Created in 1925 by the grandparents of the current owners, the garden is still managed by a small family team, assisted by students and volunteers. It's colorful herbaceous borders, water gardens, walled gardens full of roses and several more garden "rooms" are arranged around a small, private 17th century manor house. They hold more than 1,000 varieties of plants, many of them rare and hard to find elsewhere. You can buy plants in the nursery, attend a gardening school, have lunch or tea in the cafe and visit with the "wildlife". They include a pond full of wildfowl, a pair of elegant flamingos who have been resident for more than 40 years, some very cute kune kune pigs and several English longhorn cows. The garden is open several days a week between April and September and every day during bluebell season (end of April to mid May). A visit throughout the season is bound to be rewarded with ever changing, colorful displays. If you've ever sat in front of one of those motor racing arcade games, enjoying the VROOM VROOM sound effects while imagining yourself speeding around the Grand Prix course in Monte Carlo, you are going to love Northamptonshire, the super-revved up motorsport capital of Britain. Five of the world's Formula 1 teams — Mercedes, Force India, Williams, Renault (formerly Lotus) and Red Bull — are based in an area that has become known as Formula 1 Valley, covering Northamptonshire and adjacent bits of Buckinghamshire and Oxfordshire. The county claims the creation of 80 percent of the world's Formula 1 cars and engines. And Silverstone, the Northamptonshire home of the F1 British Grand Prix, is the place where you can get behind the wheel and experience those G-forces for yourself. When it's not hosting the Grand Prix or classic car races, Silverstone offers a variety of driving experiences, ranging from a "hot ride", as a passenger in a race-prepared sports car with a professional driver (£45 in 2017 ) to the Silverstone Challenge — an all day driving experience in eight different kinds of racing cars (£995 in 2017). The variations in between include going round the track in a Silverstone single-seater and short training sessions followed by your own chance to drive at speed on the famous track. We tried out a hot ride in an Aston Martin driven by professional racing and stunt driver Sam Maher-Loughnan. Fitted out with a fireproof hood and a racing helmet, each of us climbed in beside Sam for the ride of our lives, three times around the track at about 130mph. Whether you enjoy it will depend on whether you like speed, whether the idea of going sideways gives you butterflies and how well you can tolerate the extra G-forces of going round corners without breaking. It's definitely an adrenaline rush. Not into Formula 1? You could head for Rockingham Motor Speedway, which claims to be Europe's fastest banked oval racing circuit, where experiences you can book include super cars, drift driving and NASCAR-style training. Or how about a deafening day out at Santa Pod Raceway, home of the European Drag Racing Championships. On scheduled public track days there, you can take your own car or motorcycle out on the quarter-mile drag strip to test out its full-throttle performance. Northamptonshire was once the center of shoemaking for most of the British Empire. It's still a center for high quality, custom made men's shoes, several major work shoe brands and, perhaps the most iconic English shoe brand, Dr. Martens. It's a wonderful rainy day outing for shoe lovers and fashionistas, but you'll have to plan your trip for 2018 to see this fabulous collection as the museum is currently undergoing a major expansion. Happily, it's just one of many in the county — ranging from small local history and industry museums to transport museums and several heritage railways. Plan a romantic getaway to Northamptonshire at the Grade 1 Listed Rushton Hall, a historic manor that is now a fabulous luxury hotel and spa. Begun in the early 15th century, the house has a complicated history of colorful owners and plots. It even has a priests hole where secret Catholics hid their family clergy during the reign of Henry VIII and Elizabeth I and later during the English Civil War. The Tresham family, its first owners, were implicated in the Gunpowder Plot, now annually remembered in England on Bonfire Night. Charles Dickens was a frequent visitor and the hotel's amazing hall with its double hammerbeam ceiling may have been the model for Miss Haversham's house in Great Expectations. The Hope family, for whom the Hope Diamond is named, once owned the house and the fabulous jewel, now part of the British crown, was probably kept here. You can no doubt find a member of staff to expound at length about the history of this enormous and beautifully kept house, but it's much easier to simply enjoy its large, luxurious rooms, its first class kitchen and its extensive, landscaped grounds. Guest rooms overlook a lake with an island where sheep pose as if placed by an artist. The hotel spa includes a small but well equipped gym and a beautiful 18 meter heated pool. Rooms in 2017 start at a reasonable £240 for two that includes dinner (a very accomplished three-course menu, easily worth £50 per person), bed and breakfast and full use of the spa.